Glock carbine conversion kits seem like a tricky subject to navigate, but with the right guide, you’ll be on your way to vastly enhancing your Glock to unlock capabilities it simply wouldn’t otherwise have, all while retaining the excellent accuracy it already has. Read on for a breakdown on carbine kit basics, the best products on the market, and how to understand and successfully follow applicable laws. ​This may be done a variety of ways, often by implementing a holster that can be used as a shoulder stock, fastened to the pistol’s grip. ​With this feature, the front of the kit can slide forward allowing mounting of various accessories. ​With some kits, it’s possible to have a foldable stock, often detachable. ​Often combined with a shoulder stock, and also often optional in carbine kits, an increased barrel length can be added for additional accuracy. As you can see, conversion kits are not a one-size-fits-all solution, but rather are designed to find a custom solution to a common problem: the limitations of the Glock. While the Glock is an excellent handgun, conversion kits allow it to easily function more like a rifle. This can quickly bring up legal ramifications, however, which we’ll discuss at the end of our guide. ​A carbine conversion kit can drastically change the appearance, size, and weight of your gun, so you will absolutely want to be sure you know what you’re getting into. It goes without saying that you’ll need to consider where you want to store your weapon, how you’ll be using it, what you’re comfortable holding, and so on. ​There are so many kits out there, quality is a huge spectrum. In particular, you want to pay attention to the quality of the parts used and be sure that the manufacturer performs rigorous testing on their components. There’s little point reaping the benefits of a conversion if your accuracy suffers too much. While for short-range shooting this might be of a lesser concern, it should be paramount for anyone hunting or sport shooting. ​A conversion isn’t among the simplest of modifications one can do. That’s not to say it’s extremely difficult, but it will be as difficult as the manufacturer makes it. A really great kit will have clear instructions and utilize design options that make the task as simple as possible. Use the below reviews of the best Glock carbine conversion kits to find a conversion kit that fulfills your needs, without being too complicated or heavy. Remember that each is unique, and while we will analyze each on technical details and value, your needs matter the most. The RONI C-G2 is equipped with a sizeable 16” barrel to fall outside of NFA rules and is perfect for anyone who needs a more aggressive-looking option. Additionally, it improves grip and stability, so you’ll always be ready for any scenario. It also provides some nice amenities, including a detachable folding forearm grip, a rear magazine holder, and a safety-lever for the trigger guard. For your comfort, it provides an adjustable cheek rest. It’s got the basics covered, too, as the RONI C-G2 supports many accessories. With a 10” upper flattop rail, you’ll be able to combine sights, night vision, and magnifiers. Meanwhile, a 5” Picatinny side rail on each side supports lasers or lights. Complete the setup with a suppressor up to 35.5mm in diameter. We appreciate that Command Arms has created this carbine conversion kit with an ambidextrous design in mind, which extends to the trigger-guard safety as well as the cocking handle, which is fast and easy. Overall, it is very accommodating for many users and setups. You should be aware, however, that it only fits Glock Gen three through four, including compensated models, 17 and 17C. How does it operate? You’ll be able to extend the effective range of your Glock an additional 35 to 55 yards at least, although of course, going beyond this is certainly possible with skill and a proper setup. Given how accommodating the RONI C-G2 is, it is certainly possible to equip it for much further use in practice. 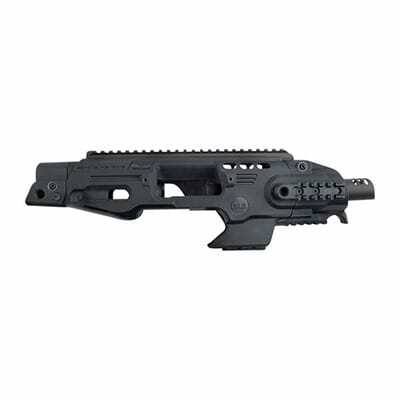 The RONI C-G2 is a perfect Glock carbine conversion kit for users who require a lot of variety or versatility in their setup, as it supports a wide variety of users and uses. The Command Arms Pistol Modular Grip is an excellent option for Glock owners looking for accommodation along with their carbine conversion kit and who prefer simplicity at the same time. It is available in models compatible with Gen three and four models 17, 18, 22, 25, 31, and 32, providing a wide range of coverage. 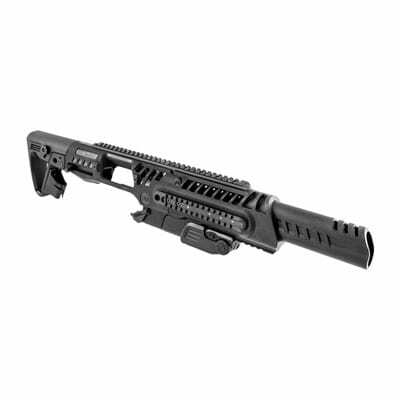 A 24cm upper flattop rail provides accommodation for a variety of sights, night vision, or magnifier. Additionally, there are three Picatinny rails for your other accessories, such as a laser. Overall, there is a lot of customization to be had. The overall design is comfortable and relatively lightweight, as its frame is efficiently designed while still rugged. You will instantly get greater stability and a better grip. Despite its lightweight construction, it’s made from a combination of aluminum and polymer, so it is also quite rugged and should hold up well in any environment. The real appeal of this setup is the fact that there’s no disassembly required of your existing Glock. Instead, you just drop it right into the shell. While by itself it won’t necessarily improve performance, and the grip and stability are welcome but not game-changers, the easy and instant flexibility to do so much certainly hold appeal. It’s not so much an instant improvement as it is a route to planned improvement, but it’s definitely a great solution to starting your perfect build. Glock owners of a wide variety of models will enjoy the easy and instant flexibility afforded by the simple Pistol Modular Grip design from Command Arms Acc. Another excellent solution for Glock owners looking to have instant customization ability with minimal effort, the Roni Conversion Stock For Glock Gen 3 & 4 from Command Arms Acc requires no disassembly, just like the last product featured on our list. It is compatible with Glock models 17, 18, 19, 22, 23, 25, 31, and 32. It offers instant improved grip and stability. You’ll also enjoy three Picatinny rails for whatever accessories you would like to add immediately upon installation. However, this model sweetens the pot with a slew of great features. First, you get an adjustable shoulder stock. This allows the user to really implement the already great accuracy of your Glock. 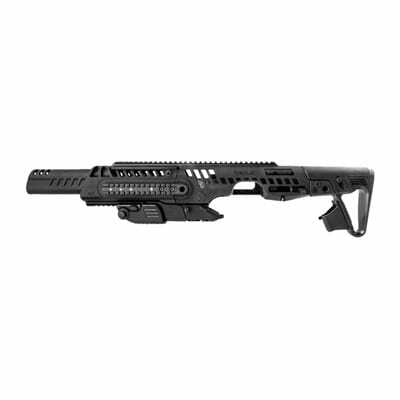 A five-position collapsible buttstock is button-activated and is complete with a comfortable and adjustable cheek piece. Finally, it also includes a detachable folding forearms grip, a rear magazine holder, and a safety lever for the trigger guard. These beautiful features are underscored by a solid design made from high-grade aircraft aluminum and polymer, ensuring long life and durability no matter where you take it. Additionally, the economical design adds only 3.1 pounds to your setup (before you add accessories, of course). Overall, it’s an excellent option for a quick setup that provides features to retain comfort and enhance existing accuracy of the Glock. Our only criticism would be that this would be a perfect model to make ambidextrous, but that won’t impact the vast majority of users significantly. As it is, it only allows for right-handed users. Providing great quality-of-life features and leaning heavily on the Glock’s accuracy, this conversion kit provides great and easy flexibility. Before you go about implementing one of the conversion kits in our guide, it’s critical to be aware of applicable laws. As these vary from state to state, it’s easy to end up on the wrong side of the law if not well-versed in your local laws. Let’s start with some background. Your average handgun and rifle aren’t regulated by the NFA whereas short-barreled rifles are. You must complete registration through the ATF and pay taxes. So, how are a handgun, a rifle, or short-barreled rifle defined? The answer is in Federal Law 27 CFR 478.11. Handguns have a short stock and can be held and fired with a single hand. A rifle is a weapon intended for firing from your shoulder. Short-barreled rifles have barrels under 16 inches long or have a total length of under 26 inches. 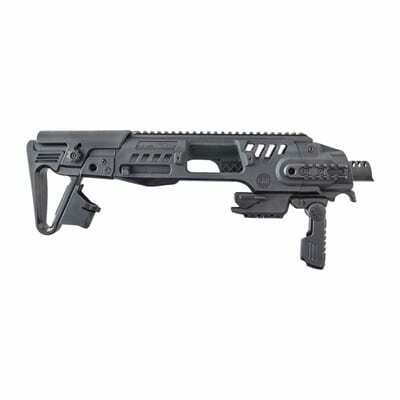 This includes collapsible stocks when fully extended unless the stock can be detached. Let’s put it all together: moving from a handgun to a rifle requires no special NFA compliance. However, be aware that if your handgun winds up firing from the shoulder and doesn’t conform to the 16-inch barrel-length requirement or 26-inch overall-length requirement, you’ve legally created a short-barreled rifle. As such, it would need to be registered to the ATF and taxed first. Now, if you add a vertical foregrip, it gets into murky territory. It’s neither designed to be fired from the shoulder nor with one hand. The short answer is, it falls into the category of “Other” and has to be registered. You should also be aware of state laws, as this is the Federal Law we’ve dissected. You’re probably aware that states can and will at times pass laws to outlaw various accessories, and whether or not such laws are determined to be Constitutional may not matter in the short term if you’re found in violation. If you find yourself in a situation you don’t understand or it appears to be a “gray area”, err on the side of caution, as at a federal level, the violation carries severe penalties, including up to ten years of incarceration and simply isn’t worth it. Finding the right carbine conversion kit for your Glock can be tricky business, but there’s nothing tricky about how great they can be for vastly enhancing the function of a Glock. Use our guide to determine the best conversion kit for you, but be sure to follow all applicable laws. In particular, pay close attention to our careful dissection of how various firearms are defined so that you don’t wind up afoul and pay a hefty price. With our guide, you can navigate the laws and market to enjoy a perfectly legal and hefty upgrade to your Glock’s capabilities.